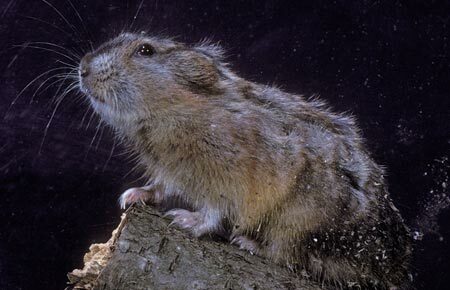 The collared lemming is the only rodent in which individuals have completely white coats in the winter season. The northern collared lemming, also known as the bering or nearctic collared lemming, is a short, stocky rodent with a thick pelage that varies seasonally. They weigh approximately 112 grams and are on average 16 cm in length. In the summer the coat is light to dark grey with a buffy to reddish-brown tone, with dark lines down the back and on the sides of the head. In the winter, their coat is pure white, except in the lemmings on Unalaska and Umnak islands (which do not molt to white pelage and also do not acquire snow claws in the winter). Dicrostonyx is the only genus in Rodentia in which individuals have completely white coats in the winter season. They also develop unique double digging claws on the front toes to break through ice and snow. Males display a polygynous mating system; they mate with multiple females and will protect their nests. Female estrus cycle lasts 9–10 days, occurring several times during the breeding season, in January through September. Gestation lasts 19–21 days. Females then give birth to a litter size of up to 11, and will have 2–3 litters per year. Average weight of young is 3.8 g at birth. Young are weaned at 15 to 20 days. Females become sexually mature by around 40 days, while males often are sexually mature around 85 days. Northern collared lemmings are herbivorous. Northern collared lemmings are herbivorous. They eat grasses, sedges, bearberry, and cottongrass in summer; in winter when lemmings live under the snow they eat twigs and buds of willow. Northern collared lemmings are found in and well adapted to the snowy, cold conditions of the arctic tundra, often being relatively dry habitats such as ridges and hummocks and habitats with an abundance of willow (Salix spp.) shrubs. They generally occupy higher, rockier, drier tundra habitats than the brown lemming. The northern collared lemming occupies runways beneath snow and will tunnel down to the permafrost level. In a study of microhabitat use in northern Canada, Predavec and Krebs wrote that collared lemmings preferred tundra with high hummocks, high percent cover of plants (especially Salix lanata) and numerous burrows. This pattern of habitat use is likely related to reducing detection and capture by predators. Like many species, lemming populations fluctuate in “booms” and “busts” over several years, but trends in periodicity are difficult to determine and studies suggest random and not cyclic fluctuations. Although Fay and Sease (1985) and Murie (1959) did not believe that D. g. unalascensis populations on Umnak Island were cyclic, they noted that populations fluctuated widely from scarce to abundant. Despite the popular myth, during periods of abundance lemmings may disperse to areas with more food, but they do not commit mass suicide by leaping from cliffs. A study of mammal diversity patterns in Canada suggests that climate change could alter and effectively remove approximately 60% of D. groenlandicus habitat with unpredictable but likely detrimental consequences for this species in the future (Kerr and Packer 1998). Extreme population fluctuations and restricted range of this species increases its vulnerability to outside threats (e.g., a rat introduction could be devastating to island populations). Lemmings did not appear to be affected by development in Nikolski village on Umnak Island appear to be insignificant. 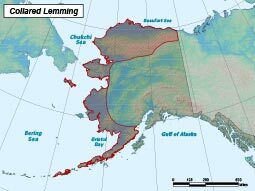 Lemmings are important prey for red fox and predatory birds on Umnak and Unalaska islands. The Norway rat, house mouse, and ground squirrel were introduced to Unalaska Island - and the European hare introduction on Umnak Island – and the effects of these introductions on the native lemming population has not been studied. Females give birth 2–3 times per year to litters of 1–11 young.